A/Professor Papantoniou treats disorders of the Adult Lumbar Spine. At different stages in our lives various lumbar spine problems can occur. In the young adult acute disc prolapses (slipped discs) can occur. These are often found in manual workers. As we get older other problems can present themselves. Arthritis can occur in the spine, as well as other parts of the skeleton. Facet joint arthritis or disc problems can lead to lower back pain or eventually spinal canal stenosis. Instability of the lumbar spine can occur for various reasons from facet joint arthritis to pars interarticularis defects. A/Professor Papantoniou treats these degenerative disorders of the Adult Lumbar Spine individually as is appropriate for each patient and their condition. Often time and non-operartive measures such as diet, exercise, physiotherapy and cortisone (steroid) injections will be able to control the pain without requiring surgery. Please follow the links for descriptions of the terms above and some of the procedures A/Professor Papantoniou offers. 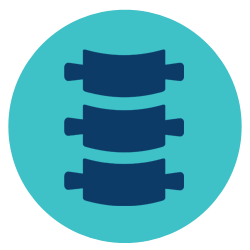 Lumbar disc prolapses (slipped discs) when a weakness of the disc occurs due to age, wear and tear or trauma such as a work injury the centre part of the disc (nucleus) or the thick rim of the disc can bulge out putting pressure on the nerve. The facet joint is a small joint between two bones in the lumbar spine. It provides bony stability and with other structures such as ligaments stops one vertebra from slipping forward on the one below. Arthritis at these joints can lead to slipping of the vertebrae or if extra bone (osteophytes) grow as a result of the arthritis pressing on the nerve or canal stenosis. The pars interarticularis (or pars) is a part of the vertebral arch. This is the bone at the back of the spine, behind the main vertebra and forms part of the arch over the back of the spinal cord. Defects of ths part of the bone can lead onto instability of the lumbar spine. of the lumbar spine allows our patients to mobilse at 4 hours or earlier and eat and drink on return to the ward. allows for smaller incisions for placement of pedicle screws in the Lumbar Spine. This minimises the trauma to the surrounding muscles.